Now that we have winter and often snow and ice on the ground, it’s important to wear proper footwear. It can be very slippery and falling can cause accidents. Microspikes are recommended and it’s important to stay on marked paths and roads. The storm in West Iceland, Westfjords and North West Iceland will more or less calm down on Thursday but still windy and snowfall in some areas. Followed by cold weather and most likely some snowfall during the weekend. Winter tires are necessary and slow down when driving in winter conditions; icy/slippery roads, snow on the roads, poor visibility, etc. All F-roads are now closed because of winter conditions and will not open until mid/late June! Conditions depend entirely on the weather which must be checked every day. Reykjanes: Constructions by Gunnuhver fixing the decks and paths. Valahnjúkur is closed due to dangerous conditions! Seltún/Krýsuvík: Part of the hot spring area is closed due to high activity and danger of expolsions. Stay out of the closed area! Þingvellir: Please stay on marked paths. Microspikes are recommended when icy. Geysir: Please stay on marked paths. Microspikes are recommended when icy. Gullfoss: Please stay on marked paths. Microspikes are recommended when icy. Western Iceland: Dangerous area around the landslide in Hítardalur. Do not go there! Important to stay on marked paths everywhere. Snæfellsjökull National Park: Important to only go on the glacier with an experienced guide. Show caution at/around sea cliffs. Djúpalónssandur: The beach can always be dangerous due to the unpredictability of the waves. 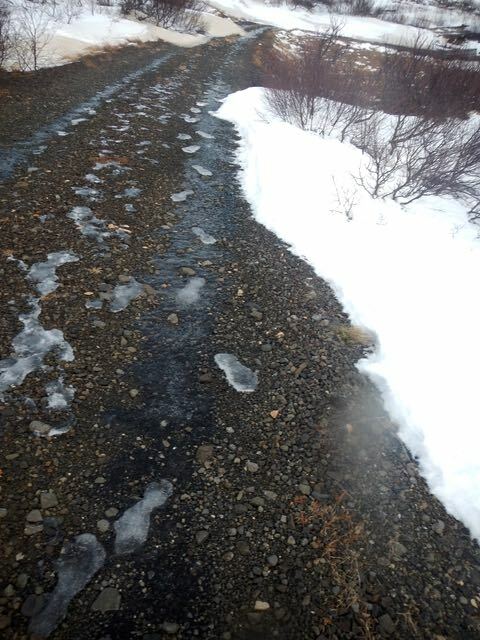 Westfjords: In general winter conditions on roads and some mountain roads are closed. Note that at bridges are sharp edges and deep holes, slow down because it’s easy to damage cars. Látrabjarg and Rauðisandur: The road to Látrabjarg has no winter service so it can become impassable very quickly. In heavy rain Látrabjarg becomes very slippery and trails become muddy. The road to Rauðisandur is very steep, threads the mountain with out protective rails which can be challenging for inexperienced drivers. Hvítserkur: The road has lots of potholes. The walking path can be icy/slippery at this time of year. Goðafoss: Microspikes are recommended when icy. Important to stay on marked paths. Mývatn: Even if the ice on Lake Mývatn looks solid, there are weak spots on it and big danger of falling through. Do not walk onto it! The road to Hverfell/Hverfjall is only passable for jeeps and impassable to Krafla/Víti. Dettifoss and Selfoss: Road 864 is closed. 862 is poen from road #1. Hengifoss: Winter conditions in the area. Microspikes are recommended. Jökulsárlón: Nothing unusual about conditions. Dyrhólaey: The road to Háey is only for 4×4 jeeps. When walking around, do not climb over fences/chains. Stay on marked paths/areas. Show extra caution when it’s windy. Reynisfjara: Next few days there will be big and extreme waves at the beach. Use extra caution, stay WELL back from the water, and do not leave children unattended! Do not enter the cave! Rocks fall from the “ceiling” and going there you can get caught in the waves. The beach can always be dangerous due to the unpredictability of the waves. Skógafoss: Important to stay within marked areas and on marked paths to protect the nature. Seljalandsfoss: Some days the trail behind the waterfall is closed because it’s icy/slippery and too dangerous. Mi rospikes are recommended when icy and it’s necessary to wear good walking shoes. Esja: Important not to underestimate the elevation gain and weather. It’s important to stay on the trails, which can at this time of year be wet, muddy or icy. It’s necessary to be dressed/equipped for winter and bad weather because the weather conditions can change very quickly. Recommended to bring microspikes, in case the trails are sicy. Recently some rocks fell from the cliffs above Steinn (the landmark stone on the trail) passing down the slope/hill below it on full speed. Important to be aware of that as it might happen again any time. Reykjadalur: It snowed quite a bit there lately so the trail is hard to walk. Proper hiking shoes required and microspikes for the icy parts. Important to stay on marked trails, nature in the area is very sensitive, plus there are dangerous hot springs around. Básar: Winter conditions in the area. Fimmvörðuháls: The trail is closed for some time to protect that nature. Winter is there with snow and bad weather conditions are a fact. The huts have closed. A challenging hike and conditions vary a lot on the weather and in general at this time of year it’s not recommended to do the trail. Þórsmörk: Winter conditions in the area. Landmannalaugar: Winter conditions. Hut is closed. Laugavegur: The huts between Landmannalaugar and Þórsmörk have closed so it’s not recommended to do the hike. Winter conditions with snow and as huts have closed there’s no shelter for bad weather. The hut in Langidalur is closed. Básar (Þórsmörk) is closed. The hut in Landmannalaugar is closed. Volcano Huts in Húsadalur is open all year round. Kjalvegur: Road F35 is closed. Kerlingafjöll: Road F35 is closed. Skaftafell: Important to wear proper hiking boots and stay on marked trails/paths. SE of Vatnajökull: Winter conditions on trails. Important to stay on marked trails/paths. Microspikes are recommended when icy. Ásbyrgi: Ice and wet snow in the area. Important to stay on marked trails. Microspikes are recommended when icy/slippery. Dettifoss: Ice and wet snow in the area. Microspikes are recommended. Be extra careful around the canyon and stay on marked paths. Jökulsárgljúfur: The hiking trail between Ásbyrgi and Dettifoss is closed because of winter conditions. Hljóðaklettar: The hiking trail between Ásbyrgi and Dettifoss is closed because of winter conditions. Mývatn: Ice and wet snow in the area. Microspikes are recommended. Even if the ice on Lake Mývatn looks solid, there are weak spots on it and big danger of falling through. Do not walk onto it! Dimmuborgir: Ice and wet snow. Important to stay on marked trails. Microspikes are recommended when icy/slippery. Hornstrandir: The scheduled boats have stopped sailing there. Winter conditions and no hiking. Glymur: Log has been removed so there is no way but wade through the river. The current is quite strong and the river is ice cold so wading through is not for everyone.